Having new siding installed is the one chance any homeowner has to completely change the exterior appearance of their house. It’s “Extreme Makeover: Your House Edition.” The fun part comes in the design phase as colors, accents, styles, and profiles are examined. However, before we dive into the fun stuff, what do we want this siding to be made of? The most popular options are vinyl, steel, and composite materials. Many salespeople that come to your house for a “free in-home estimate” (translation: high pressure sales pitch), will go on to tell you that their product is the best and show you “kill pages” on all the rest. For example, someone trying to sell you vinyl might show you pictures of all the other types of siding failing miserably: paint peeling off composite material, steel siding rusting and dented, wood-pecker holes in wood siding. 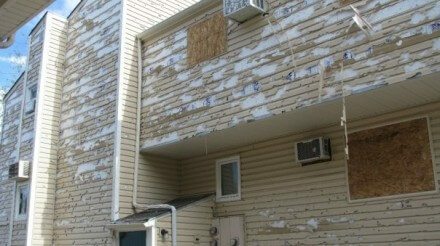 Those pitching against vinyl will show pictures of faded, warped, chalky, and cracked vinyl siding. Every type of siding can be shown as awful by the competition. Now, before you give up and start getting quotes on brick like the third little pig, let’s break this down a little further in the interest of keeping the price from going through the roof. Not all vinyl is created equally. “Builder-grade” vinyl popped up in many of the neighborhoods being mass built during the building boom. It was lower thickness, faded horribly, cracked easily, and gave vinyl a bad name. Vinyl can still be a great option for a long-term siding solution as long as you go with a minimum .046 thickness. Those panels are considered premium, so not only are they stronger, but they also get treated with much more fade protection. I’m still leery of very dark colors on vinyl; those colors just absorb too much sunlight over time. Using dark colors as an accent in the peaks on the front of the house is OK, and very popular; even better if the front of the house faces north and gets no direct sunlight. Foam-backed vinyl options are really catching on as they add strength to the panel (no cupping), and they add insulation value. Those panels can come in the popular 6” exposure that composite boards come in. Hollow-backed vinyl typically comes in the narrower 4” or 4.5” exposure. Form-fit foam can be added to those panels for an extra cost. Vinyl is low maintenance and will never need to be painted. Stick with a premium thickness and you’ll be happy with the results. Steel is vinyl’s sturdier older brother. PVC coated steel also has premium fade protection with a better result on long-term color retention for darker shades. Insulation can also be added, but typically in a flat foam product since the steel is rigid enough to stay straight on its own without the help of a form-fit foam backer. I’m not mentioning aluminum as an option because it's almost gone from the marketplace. Steel is an obvious choice over aluminum, which will dent if you look at it wrong. Steel is another great low-maintenance choice with prices only slightly higher than premium vinyl. Cement composite boards and wood composite boards are extremely popular right now. They have the “traditional” look that many homeowners love. They are leaps and bounds above their predecessor, hardboard (aka - Masonite®). Hardboard siding was basically pressed sawdust and glue, which swelled and fell apart over time as moisture penetrated the panel. The new boards have supreme resistance to moisture and are absolutely included in long-term siding solutions for your home. James Hardie® is the leading manufacturer of fiber cement siding, and has done an excellent job of making their name synonymous with fiber-cement siding, just like Masonite® did with hardboard siding. The other common type of composite siding is a wood composite, LP Smartside®. These products are visually indistinguishable, and are unquestionably the siding of choice on new high-end homes being built in Minnesota today. They must be painted, however, and you can choose to have them pre-finished in the factory or have them painted once they are installed. Again, darker colors can fade over time but these panels are made to be repainted. Unlike steel or vinyl, you could completely change your house color down the line without replacing your siding. The pre-finishing or painting costs will make this siding more expensive than steel or vinyl, but many are willing to take the trade-off for the look they want. There is also the added benefit of putting on a fresh coat of paint years down the line when it is time to sell the house. There are many happy homeowners with all of the above products, so don’t let any salesperson tell you otherwise. All homeowners can be matched to a product and company that uniquely fits their wants, needs, budget, and design specs. All of the contractors I work with at My 3 Quotes have the ability to superimpose new siding on a picture of your house to help with the visualization. For an unbiased viewpoint on any exterior product, I am always happy to take your calls or e-mails. Ryan Carey has 15 years of experience in exterior remodeling for Twin Cities Homeowners and Property Management Companies. He is the owner of “My 3 Quotes,” a company that provides the free service of collecting 3 competitive home improvement bids for customers. For more information, visit www.getmy3quotes.com for free home improvement estimates.